Oh my good God. I'm fairly certain I have discovered the face cream to end all face creams ... and it came at the perfect time, as my skin has been flaky and under moisturized for days now. (Winter is still rearing its ugly head!) 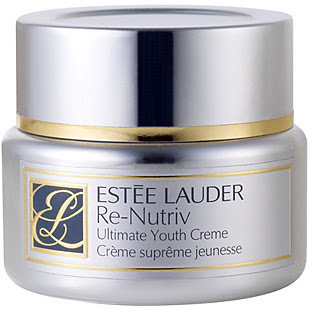 Thank goodness the new Estee Lauder Re-Nutriv Ultimate Youth Creme found its way onto my desk, and not a second too late! Now, before I get into the nitty gritty of what makes this item so unbelievably amazing, I do need to give you one piece of bad news. Each 1.7oz. tub retails for $250 on Estee Lauder's website. And yes, I know that rivals the skincare from renowned line La Mer! But hear me out -- this cream will have you dancing in the streets, swinging from the rafters, singing for the whole world to hear. The goal of this cream is to make your skin look younger, smoother and more flawless for years to come. This is accomplished through the Youth Molecule-Resveratrate, a more potent form of Resveratrol which is exclusively Estee Lauder's and purports to protect skin from environmental damage. Well, I'm here to tell you that IT WORKS. With only one application, my skin immediately became dewy, fresh and so youthful I was afraid I'd be mistaken for a 15-year-old at my breakfast meeting the next morning! All traces of dryness and flakiness were instantly swept away, while the cream left behind no greasy residue but truly made my skin look refreshed and simply gorgeous. I've become a total junkie for this cream now, applying at least twice a day and longing for the time I can reach for it again. Best of all, it's so rich and lush that you hardly need to apply any -- which definitely means your $250 will last you for quite a long time. I know it's difficult to spend that much on anything -- but believe me, if you're going to go broke on any beauty product this year, it just has to be this one. Your skin will most definitely thank you. Really appreciate this...Hope﻿ to see more good posts in the future.